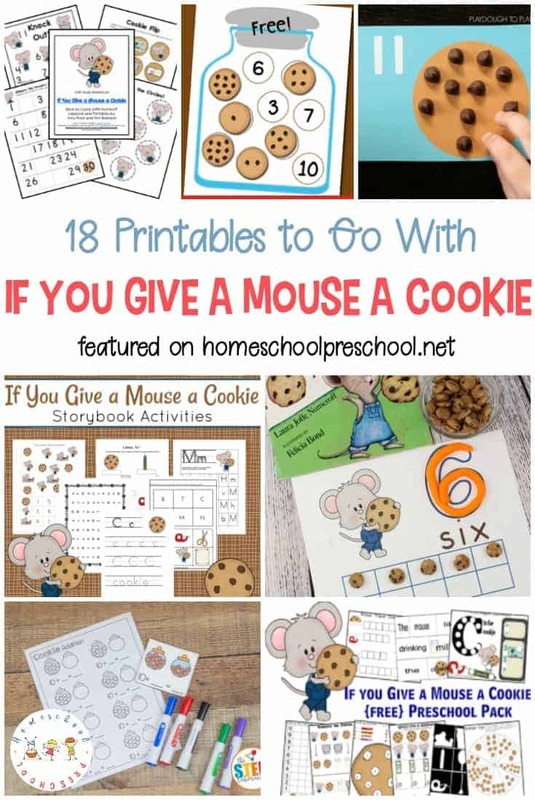 After reading If You Give a Mouse a Cookie with your preschoolers, let them practice counting items and writing numbers from one to ten. 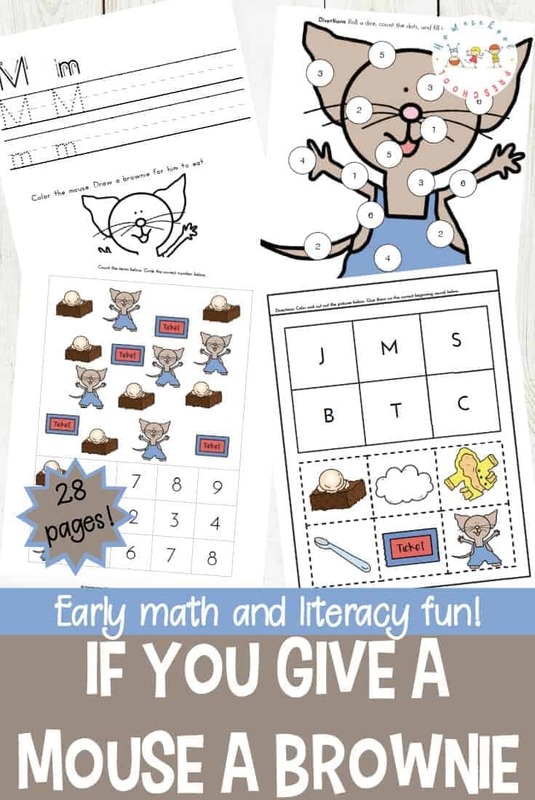 This is a great way to reinforce one-to-one correspondence, scissor skills, and handwriting in one fun printable pack. 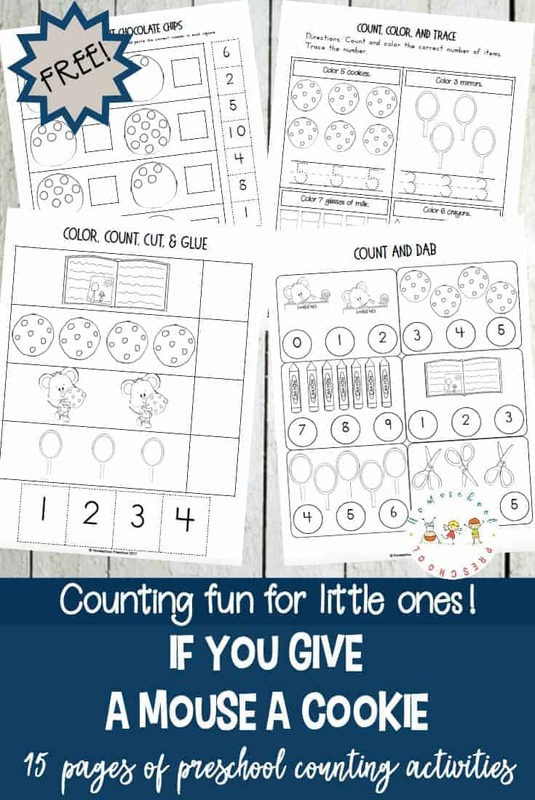 Engage your young learners with this fun pack of counting activities! 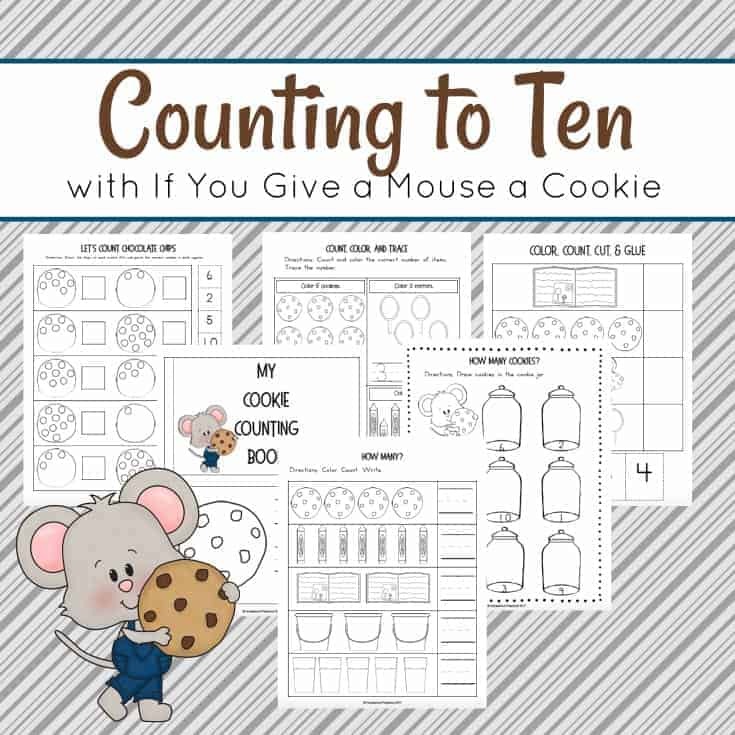 Whether your preschooler is learning to count to ten or just need a little additional practice to solidify their counting skills, this collection of counting activities goes perfectly with If You Give a Mouse a Cookie. 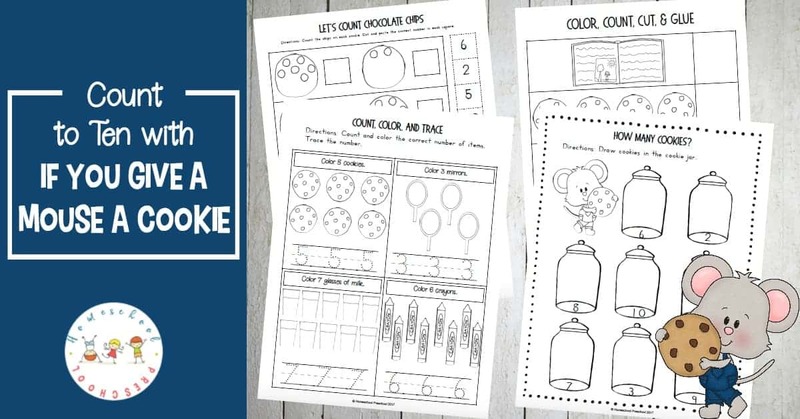 After you read the story to your preschoolers, work through some or all of the counting activities included in this fun pack. • How Many? – Kids will color the pictures, count them, and write the correct number on the line. • How Many Cookies? – Draw cookies to match the number on the cookie jars. 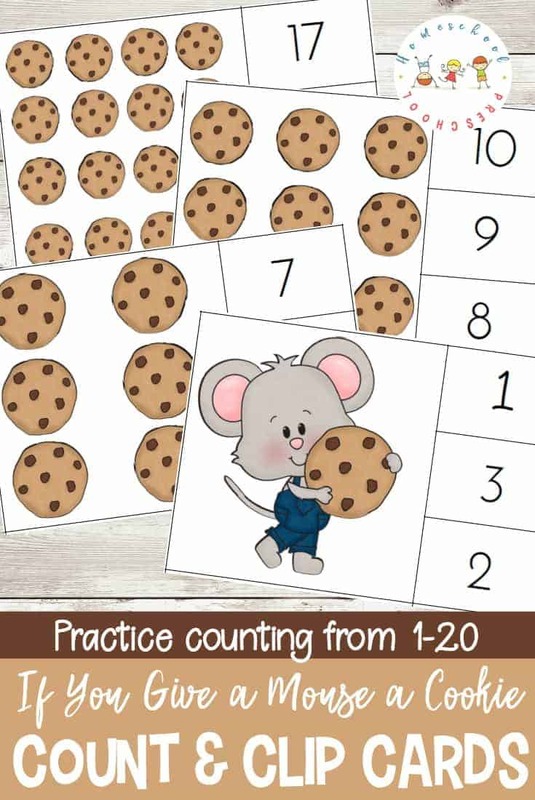 • My Cookie Counting Book – Count and color the pictures. Trace the numbers on each page. • Color, Count, Cut, and Glue – -Color the pictures, count them, and glue the correct number in each row. • Fill in the Ten Frame – Identify the numbers on each cookie, and fill in the ten frame. • Count and Dab – Count the pictures, and identify the correct number. • Count, Color, and Trace – Follow the directions to color the pictures. Trace the numbers in each box. • Let’s Count Chocolate Chips – Count the chocolate chips. Cut and paste the correct number beside each cookie. • Count and Color – Count the dots, and use the color code to finish the picture. • Roll and Color – Roll a die, count the dot, and color a picture. Looking for more fun items to help you teach your kids? Check out my top picks from Amazon! • If You Give a Cat a Cupcake – If you give a cat a cupcake, he’ll ask for some sprinkles to go with it. When you give him the sprinkles, he might spill some on the floor. Cleaning up will make him hot, so you’ll give him a bathing suit . . .
• If You Take a Mouse to the Movies – If you take a mouse to the movies, he’ll ask you for some popcorn. If you give him the popcorn, he’ll want to string it all together. Then he’ll want to hang it on a Christmas tree.